Fishing Boats Off the Coastline, oil on canvas laid on board, 12"x20"
Born in England. His family moved to Maryland in 1844 from Lancashire, England. One of twelve children and oldest of Moran brothers, Thomas and Peter. Father of Percy and Leon. Began painting in the early 1850s. One of the best-known marine painters. 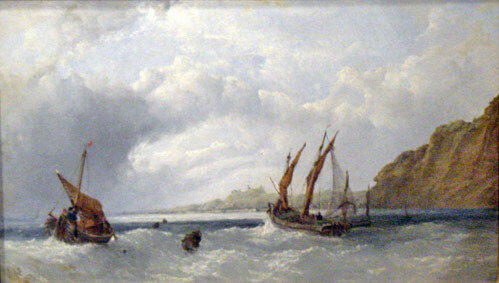 His “Hints for Practical Study of Marine Painting” were published in the Art Amateur in 1888. After traveling, he relocated to New York. Studied: with James Hamilton and Paul Weber in Philadelphia; Royal Academy, 1861. Member: Philadelphia Academy of Fine Arts; Associate of National Academy of Design. In the collection of: Phoenix Art Museum; San Diego Museum of Art; Santa Barbara Museum of Art; Denver Art Museum; National Gallery of Art; Smithsonian American Art Museum; Georgia Museum of Art; High Museum of Art; Indianapolis Museum of Art; Museum of Fine Arts, Boston; Peabody Essex Museum; Washington County Museum of Fine Arts; Brooklyn Museum of Art; Metropolitan Museum of Art; Munson Williams Proctor Institute; Columbus Museum of Art; Butler Institute of American Art and more.